Not what it looks like: Sarah Roberts was attempting to retrieve a flip flop from her vehicle after she rolled it. 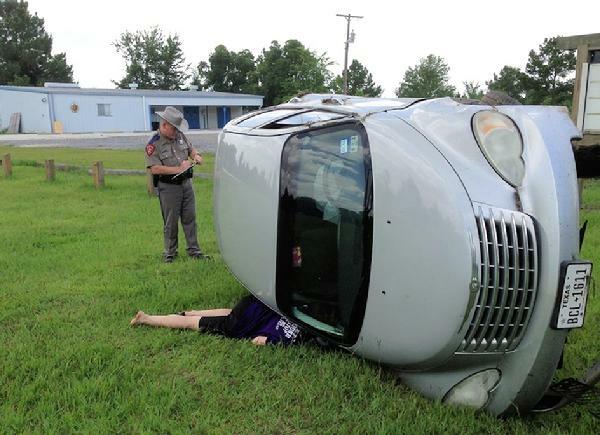 Driver Rolls Vehicle, Charged with Felony DWI, LIVINGSTON, June 11, 2013 - Shortly before 1 pm on June 11, 2013 sliver 2006 Chrysler PT Cruiser driven by Sarah Bea Roberts, 29, of Livingston, was north-bound on FM-350 South. Roberts' vehicle left the road to the right, struck a culvert and rolled coming to rest in a field next to the Knights of Columbus Hall near the Polunksy Unit. Americare Ambulance Service was dispatched to the scene along with Trooper Donny Akers of the Texas Highway Patrol. Fortunately for Roberts, the ambulance wasn't needed, but she had other problems to deal with. Trooper Akers conducted a field sobriety test and placed Roberts under arrest for driving while intoxicated. Akers found fake weed and prescription pills in Roberts' possession and she was driving with a suspended license. Further, this is Roberts' third DWI making this a felony DWI. Roberts was transported to Livingston Memorial Hospital for a mandatory blood withdrawal. Roberts' vehicle was recovered by a rollback wrecker from Harwood Wrecker Service and will be stored in Livingston. Roberts struggles during a field sobriety test. Trooper Donny Akers placed Roberts under arrest for driving while intoxicated.